Is one of your new year’s resolutions to explore more of the many diverse cultural opportunities that Los Angeles has to offer? There’s lots to choose from this month, especially with the art initiative Pacific Standard Time: LA/LA that’s going on right now. It’s a collaborative effort from arts institutions across Southern California that explores Latin American and Latino art in Los Angeles. Some exhibitions end at the end of the month. You can sort exhibitions by theme, neighborhood, venue, and media which makes the whole process of deciding what to see where less overwhelming. I have visited three exhibitions (listed below) and found them all interesting and worth the visit. One of my favorite Scandinavian events returns this month. The Scandinavian Film Festival LA opens this weekend in Beverly Hills. I always look forward to seeing what’s being offered and hope there’s a movie that will transport me back to Norway through language and setting or bring alive a part of Norwegian history for me. I also don’t mind being an armchair traveler to other countries in the region. For a look at what’s being offered this year, check out Scandinavian Film Festival 2018: A Preview. How will you explore the richness of Los Angeles this month? Visualizing Language: Oaxaca in L.A. , Central Library, Downtown LA, on display until January 31, 2018. 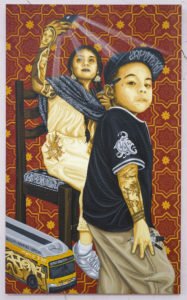 The exhibition celebrates the rich social fabric of Los Angeles through the lens of the city’s vibrant Oaxacan community — specifically, the Zapotec communities which make up one of the largest Indigenous groups in Mexico and Los Angeles. The Oaxacan artist collective Tlacolulokos has created a series of new murals for the Central Library’s historic rotunda that explore language and culture as a key lifeline sustaining the shared experience between Mexico, Los Angeles, and beyond, with a look at how migration and the socio-political environment shape identity and cultural traditions. Surface Tension by Ken Gonzales-Day: Murals, Signs, and Mark‐Making in LA, Skirball Cultural Center, Los Angeles, on display until February 25, 2018. See a new body of photographic work by interdisciplinary artist Ken Gonzales-Day examining the mural landscape of LA—from East LA to Venice Beach, from Pacoima to South LA. 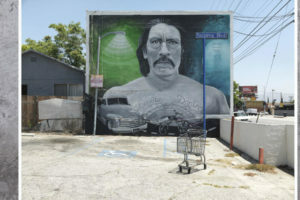 Featuring over 140 photographs, Surface Tension by Ken Gonzales-Day: Murals, Signs, and Mark‐Making in LAconsiders what the city’s walls reveal about its diverse communities. Cuba Is , Annenberg Space for Photography, Century City, on display until March 4, 2018. Revealing complexities both on and off the island, Cuba Is explores aspects of Cuba not easily accessed by foreigners, and sometimes not even by Cubans themselves. Born from indigenous, African and European roots, divergent politics and limitations in communication and commerce, the Cuba seen in this exhibition goes beyond the folklore and offers new insight into its current reality. Over 120 photos feature subjects ranging from defiant youth known as “Frikis” to the hard-partying children of the 1%, the underground system of sharing digital content—“El paquete”—to Miami’s Chonga girls. Undiscovered Chinatown Walking Tour , Chinatown, Saturday, 1/6, 10:30 a.m. – 1:00 p.m. (Offered every first Saturday of the month). Visit a temple, an herbal shop, art galleries, antique stores, and more when guided to the unique treasures—not to mention great bargains—to be found in Chinatown. Wear comfortable walking shoes and be prepared to wind your way through a myriad of alleyways, plaza stalls, and classical courtyards to discover the charm of L.A.’s Chinatown. Scandinavian Film Festival Los Angeles (SFFLA), Writers Guild Theater, Beverly Hills, Saturday, 1/6, & Sunday, 1/7 (also weekend of 1/20 & 1/21). This is a yearly showcase of films from northern Europe and its Baltic neighbors. During the course of two weekends, the festival screens not only films submitted by Nordic countries to the Academy for consideration in the “Best Foreign Language Film” category, but also other Nordic feature films, short movies, and documentaries. Epiphany of the Three Kings, Olvera Street, Downtown LA, Saturday, 1/6, 6:30 p.m. Learn about and experience the celebration of the Epiphany of the Magi (Visit of the Three Kings). In Mexico and other Latin countries, many children receive their Christmas gift on this day. Olvera Street celebrates this tradition with prizes, free champurrado (Mexican traditional chocolate drink), and pan dulce (Mexican sweet bread) as well as a piñata filled with candies for the children to break and enjoy. There will be music and a procession on Olvera Street followed by a colorful theatrical production in the Plaza. Oshogatsu Family Festival – Year of the Dog , Japanese American National Museum, Downtown LA, Sunday, 1/7, 11:00 a.m. – 5:00 p.m. Ring in the New Year and the Year of the Dog with fun arts ‘n crafts, delicious food, and exciting cultural activities and performances. Highlights of the day will include a Japanese-style lion dance; two mochitsuki (rice pounding) demonstrations, with mochi samples for tasting; a drawing demonstration and book signing by comic book creator Stan Sakai, famous for his Usagi Yojimbo series; and sample bowls of lucky zaru soba (cold buckwheat noodles) to bring good health in the New Year. There will also be a variety of craft activities, book readings, souvenir photos, a koto performance, and more. Visit website for schedule of events and activities. Festival of India , Bowers Museum, Santa Ana, Sunday, 1/7, 11:00 a.m. – 3:30 p.m. 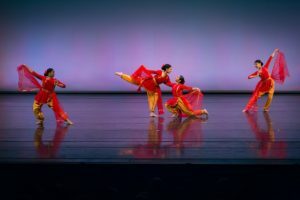 Enjoy the beautiful music and dance of India with internationally recognized choreographer Ramya Harishankar’s Arpana Dance Co. along with other invited artists as they perform the beautiful dances of the diverse regions of India. The festival also features a special performance by SADUBAS, aka The Sadhus of Bass, who converges classical Indian rhythms with 70s Bollywood vibes to create psychedelic soundscapes that are one part Trip hop and two parts cinematic south Asia. DJ/producer Ameet Mehta and tabla artist Robin Sukhadia present visuals and sound inspired by Bollywood funk and Indian Classical music. Festival includes art projects, face painting and special Indian sweets. ¡Hoy en Día! (Andell Family Sundays), LACMA, Miracle Mile, Sunday, 1/7, 12:30 p.m. – 3:00 p.m. (Offered every Sunday in January except 1/28). Make, look, and talk about art at Andell Family Sundays. This weekly family event features artist-led workshops and friendly gallery tours and activities thematically based on special exhibitions and LACMA’s permanent collection. Drop in anytime between 12:30 and 3:30 p.m. During the month of January, sixteen contemporary Latino artists from Latin America and the U.S., plus two-month residencies, equal surprising, playful, and unexpected art. Explore the special exhibition A Universal History of Infamy, then participate in artist-led workshops in bookmaking, mixed media, and performance/dance. Radical Flags (Kids and Families Program), California African American Museum, Exposition Park, Sunday, 1/7, 1:00 p.m. – 3:00 p.m. Faith Ringgold’s People’s Flag Show Poster and The Judson 3, both on display in We Wanted a Revolution: Black Radical Women, 1965–85, express solidarity with the tumultuous times of the 1970s. Create your own radical flag using a collage of words and images that reflect something you feel passionate about in this decade. Suitable for third grade and up. Kids in the Courtyard: Painting with Music, Fowler Museum at UCLA, Sunday, 1/7, 1:00 p.m. – 4:00 p.m. Celebrate the closing day of the exhibition How to Make the Universe Right by learning about instruments from Vietnam and southern China. After finding inspiration in the galleries, create a watercolor painting while listening to music from around the world—including the very same songs introduced in the exhibition. Family Art Workshop, Junior Arts Center at Barnsdall Art Park, Hollywood/Los Feliz, Sunday, 1/14, 10:00 a.m. – 12:00 p.m. Join instructors for a free family art workshop in a real art studio. Each Sunday a different culture and media are featured. All materials are provided. ¡Hoy en Día! (Andell Family Sundays), LACMA, Miracle Mile, Sunday, 1/14, 12:30 p.m. – 3:30 p.m. (Offered every Sunday in January except 1/28). Make, look, and talk about art at Andell Family Sundays. This weekly family event features artist-led workshops and friendly gallery tours and activities thematically based on special exhibitions and LACMA’s permanent collection. Drop in anytime between 12:30 and 3:30 p.m. During the month of January, sixteen contemporary Latino artists from Latin America and the U.S., plus two-month residencies, equal surprising, playful, and unexpected art. Explore the special exhibition A Universal History of Infamy, then participate in artist-led workshops in bookmaking, mixed media, and performance/dance. 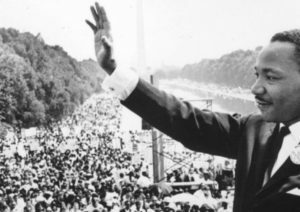 Martin Luther King Jr. Day Celebration, California African American Museum, Exposition Park, Monday, 1/15, 10:00 a.m. – 5:00 p.m. Celebrate Martin Luther King Jr. Day by surrounding yourself with art, culture, and community. Enjoy an array of vibrant programs and activities for all ages. Bring the kids for art-making activities and food, visit our exhibitions, hear a marathon reading of King’s lesser-known speeches and sermons, and much more—free for everyone! Visit website for schedule of events and activities. Scandinavian Film Festival Los Angeles (SFFLA), Writers Guild Theater, Beverly Hills, Saturday, 1/20, & Sunday, 1/21. This is the second weekend of this yearly showcase of films from northern Europe and its Baltic neighbors. The festival screens not only films submitted by Nordic countries to the Academy for consideration in the “Best Foreign Language Film” category, but also other Nordic feature films, short movies, and documentaries. Family Art Workshop, Junior Arts Center at Barnsdall Art Park, Hollywood/Los Feliz, Sunday, 1/21, 10:00 a.m. – 12:00 p.m. Join instructors for a free family art workshop in a real art studio. Each Sunday a different culture and media are featured. All materials are provided. ¡Hoy en Día! (Andell Family Sundays), LACMA, Miracle Mile, Sunday, 1/21, 12:30 p.m. – 3:30 p.m. (Offered every Sunday in January except 1/28). Make, look, and talk about art at Andell Family Sundays. This weekly family event features artist-led workshops and friendly gallery tours and activities thematically based on special exhibitions and LACMA’s permanent collection. Drop in anytime between 12:30 and 3:30 p.m. During the month of January, sixteen contemporary Latino artists from Latin America and the U.S., plus two-month residencies, equal surprising, playful, and unexpected art. Explore the special exhibition A Universal History of Infamy, then participate in artist-led workshops in bookmaking, mixed media, and performance/dance. Kids in the Courtyard: Frame Your World, Fowler Museum at UCLA, Sunday, 1/21, 1:00 p.m. – 4:00 p.m. Explore the black-and-white photographs of Pierre Verger on closing day of the exhibition Africa/Americas. French-born Verger traveled around the world, capturing people, places, and traditional customs through his camera lens. Create and decorate a monochrome frame for your own photographs using Verger’s images as inspiration. 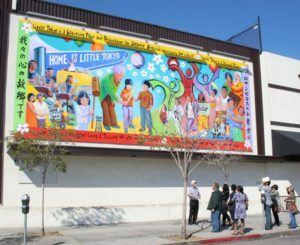 Little Tokyo Walking Tour , Japanese American National Museum, Downtown LA, Saturday, 1/27, 10:15 a.m. – 12:15 p.m. Relive history and learn about present-day Little Tokyo with JANM docents. Comfortable walking shoes are recommended. Weather permitting. Buy tickets in advance. $12 members, $15 non-members. Museum admission is included. Limited to 20 participants. Family Art Workshop, Junior Arts Center at Barnsdall Art Park, Hollywood/Los Feliz, Sunday, 1/28, 10:00 a.m. – 12:00 p.m. Join instructors for a free family art workshop in a real art studio. Each Sunday a different culture and media are featured. All materials are provided. Collage Faces: Express Yourself (Kids and Families Program), California African American Museum, Exposition Park, Sunday, 1/28, 1:00 p.m. – 3:00 p.m. Using collage and painting, artist Lezley Saar leads a family workshop to reflect on identities seen and expressed. Fabrics, curious still life objects, and a variety of materials will be provided to fully explore and express your creative self. Feel free to add events for the current month in the comments below. I also welcome feedback on any events you have attended. If you have suggestions about future events and celebrations to include in upcoming months, please email me the details. Thank you! 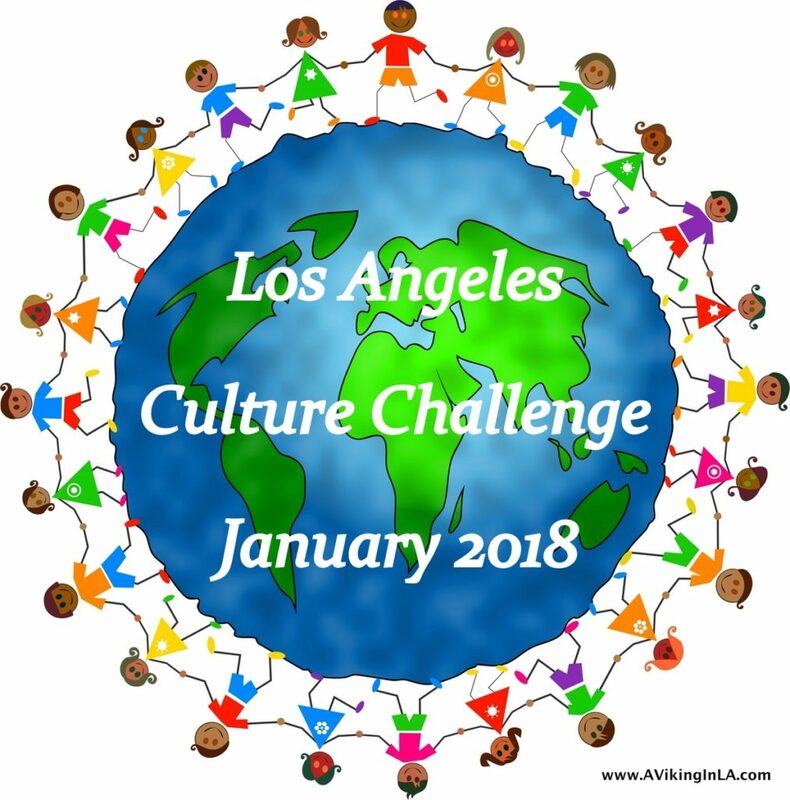 This entry was posted in Culture Challenges, Los Angeles & Environs by Patricia Zanuck. Bookmark the permalink.